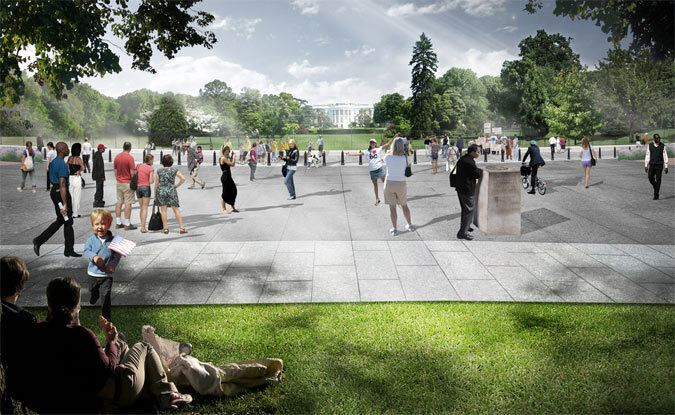 Today, the National Capital Planning Commission (NCPC) announced that Rogers Marvel Architects (RMA) has won a design competition to revamp President’s Park in Washington, DC. 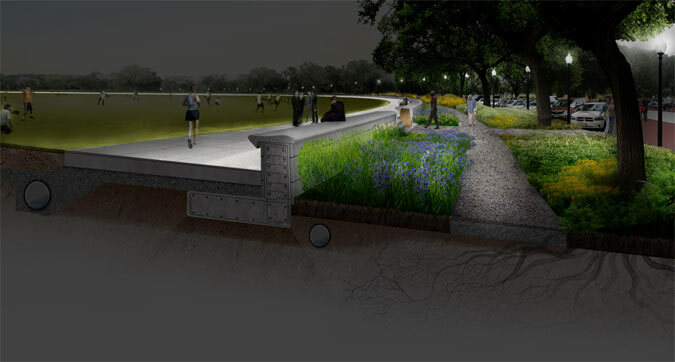 The New York-based architects bested a distinguished list of landscape designers, including Hood Design Studio of Oakland California, Michael Van Valkenburgh of Brooklyn, and Reed Hildebrand Associates and SASAKI, both of Watertown, Massachusetts. After September 11th, 2001, security design in major public spaces took on a new significance, and President’s Park South—a large ellipse forming a public extension of the White House’s front lawn—this meant concrete jersey barriers and fences along E Street. Soon, though, the park could become one of the most pedestrian-friendly—and secure—in the capital, thanks to RMA’s subtle combination of landscape architecture and security design. RMA is no stranger to blending security design seamlessly with the surrounding landscape. 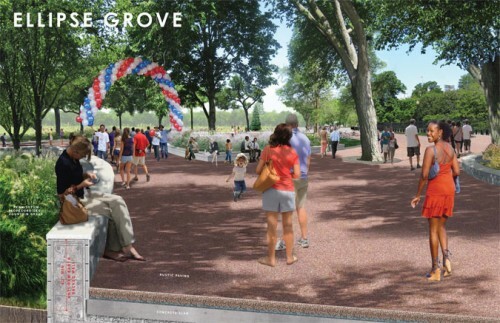 In New York, they created a secure streetscape for Battery Park City near the World Financial Center, complete with anti-ram walls, public amenities, and landscaping. 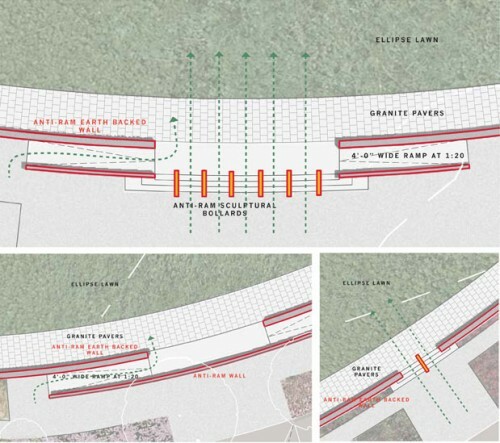 Nearby, they designed a secure streetscape along Wall and Broad streets guarding the New York Stock Exchange, where sculptural bollards and a mechanical turntable flush with the street both create a distinct pedestrian environment and permit service vehicle access. 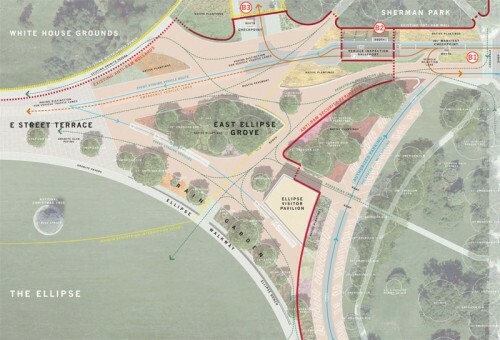 Officials at the NCPC said today that a design competition was held to garner ideas about making a world-class public park, one where security is key but does not dominate the space. 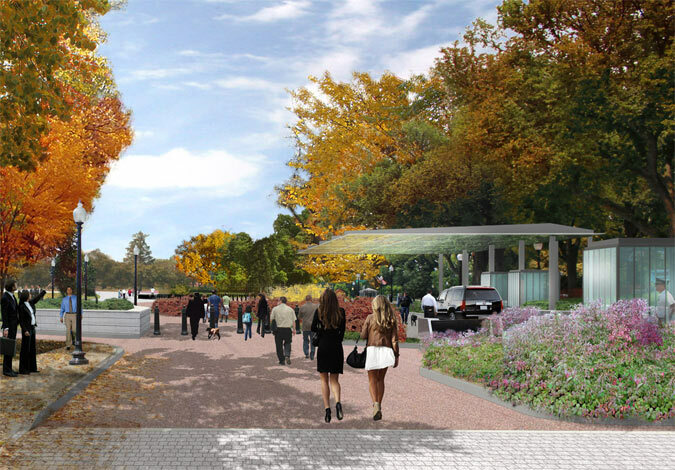 NCPC chairman L. Preston Bryant, Jr. praised RMA’s design as a bold statement about security and landscape design that offers a model for keeping our public spaces open and inviting. 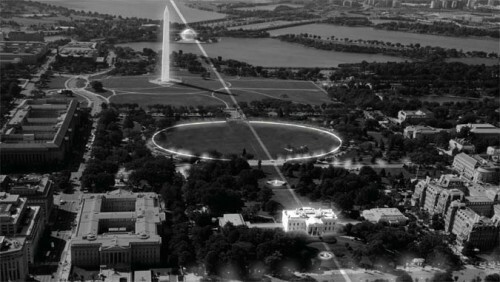 At the heart of RMA’s Washington D.C. design is the strategic layering of security perimeters, which form a flexible boundary accommodating a variety of security scenarios. To accomplish this, the architects raised the central ellipse and placed an anti-ram wall that doubles as a bench around its perimeter; the bench seating faces the ellipse and helps define the iconic space. 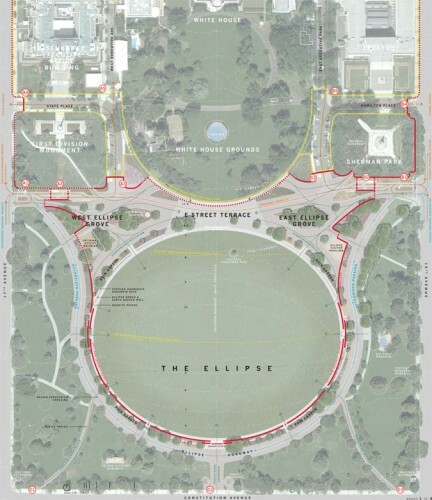 According to RMA, this elevational tilting formally “presents” the ellipse lawn to the White House while also screening nearby parking spaces from the view of park goers. Punctuating the new perimeter wall are distinct pedestrian entrances with sculptured bollards to help guide pedestrian flow. This new boundary allows for the pedestrianization of E Street facing the White House. 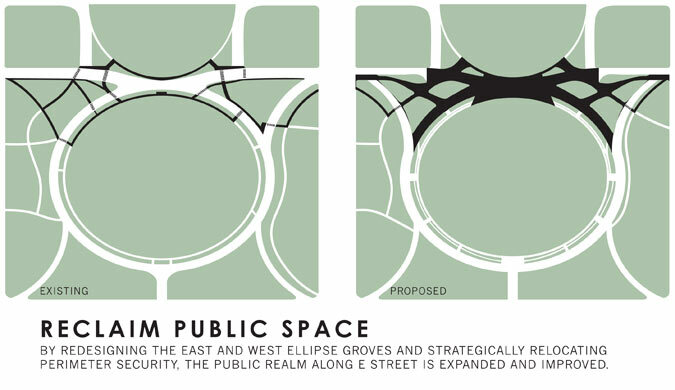 RMA vastly expanded the public space forming a large plaza—the E Street Terrace—flanked by leafy groves containing concession and maintenance structures. Officials at the NCPC said at today’s announcement that elements of all five short-listed proposals could be incorporated into the final plan. 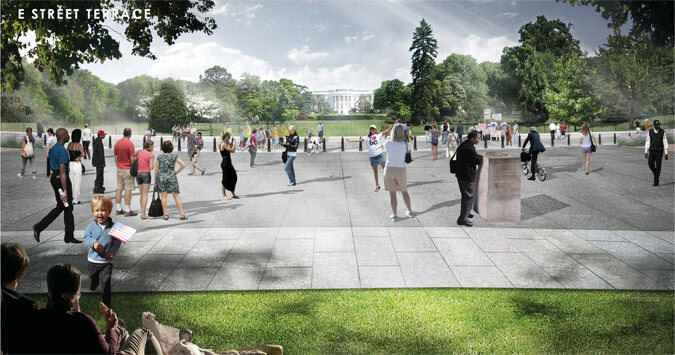 Next, the National Parks Service and the United States Secret Service will review RMA’s design before it heads to federal, local, and public review. Landscape Architecture Marvel Architects Parks Security Design Washington, D.C.